The weather can change rapidly in late autumn and winter may be here before you know it. Stocking up on essential supplies is best done well before the season shifts when severe storms, icy roads and dangerous conditions can make it too difficult to get to a store. 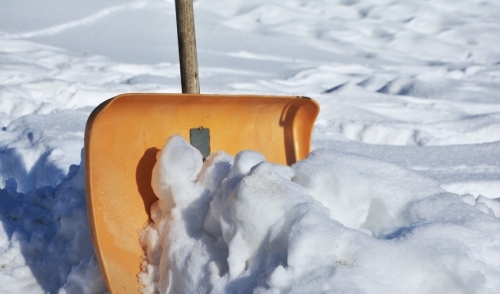 Shovels: Be ready to move aside snow with the proper type of shovel, and check old shovels for wear and damage that may make replacements necessary. Don't forget a small shovel for the car, as well as a roof rake or other specialized shovels. Rock Salt: Basic rock salt is ideal for melting large, stubborn patches of ice and keeping large spaces slip-free. Keep salt for driveways, decks, large patios or other surfaces, and be sure to put some in the car in case you get stuck. Ice Melts: Ice melt compounds do the same job as salt but with different chemical compositions. This can be useful in areas where salt may damage delicate concrete or could get onto grass or flowerbeds. Sand: If you prefer to avoid chemical use in winter, opt for the good, basic grit of sand instead. While it won't melt ice or snow, it will provide traction for getting over slippery spots. Batteries: In case of a power outage, spare batteries are essential for flashlights and radios. It's also wise to check smoke detector batteries and car batteries to be sure everything is fully charged as winter approaches. Candles: Candles can not only provide light in case the electricity is out, but they can help furnish heat. Stock up on large, unscented candles, and be sure to have plenty of matches on hand. Firewood: Stocking up on firewood in late summer and early fall gives the wood a chance to fully dry and season properly before it will be used. Keep wood in a cool, dry place that is easily accessible and you'll be ready for cozy winter fires. Warm Clothes: Before the snow flies, be sure you're equipped to enjoy it with warm coats, gloves, scarves, boots and other gear. Check that extra blankets are available, and store a set of extra warm gear in each vehicle in case of an emergency. Non-Perishable Food: Winter storms can last several days, and it may be impossible to get to a grocery store during that time. Stock your cupboards with long-lasting or non-perishable essentials such as soup, canned fruits and vegetables, cereal, bottled juice and water, and don't forget a can opener! In addition to these basic winter essentials, evaluate your family's needs and keep a good stock of necessary medication, baby food, pet food and other supplies that can come in handy if the winter gets rough. If you're properly stocked, you can enjoy the beauty of winter without worrying about supplies.